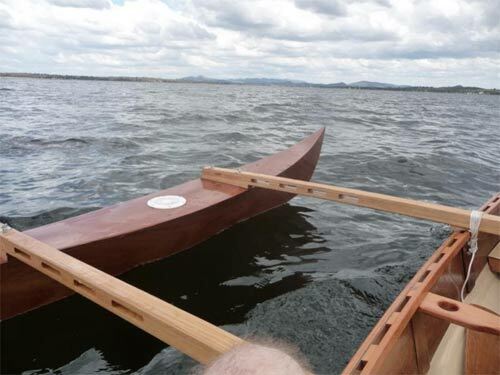 The first time I fooled around with this concept we took an elegant Strip Planked REDBIRD canoe and fitted it with this outrigger system. It is designed to be light and easily removable. With the additional stability we were able to cram on a significant amount of sail in a simple Lateen Rig. - about 7.5 sq metres (80 sq ft) for real sailing performance. One of the advantages of the lateen rig is that the sail can be a backyard manufactured item. We made ours out of a blue plastic tarpaulin - I think the total sail cost was about $40. The Lateen even if cut completely flat develops a useful driving shape when loaded up by the wind. The boat whipped along very well and did not really require a leeboard provided the leeward hull was well immersed. It had a surprising turn of speed and was quite exciting to sail. The only downside was that the Redbird canoe hull, being a brilliant straight line paddling boat, just refused to go round corners easily - it just refused to tack through the wind. Either it had to be assisted by someone with a paddle - or the tack was completed by the boat picking up a little bit of speed in the backwards direction then steered out with reverse rudder. Not a big problem at all - and the speed in a straight line made it all very worthwhile!! Any relatively narrow hull (under 4ft, 1.2m) is suitable, whether a canoe, kayak or rowboat. In other words, the steering characteristic of the whole shebang is defined by the main hull. The owner used it for holidays - it all roofracks easily because of the light weight - and for fishing. 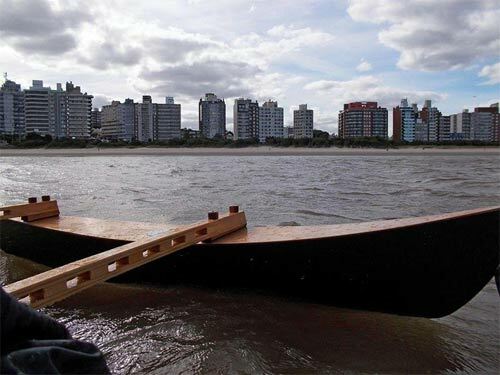 There have been a couple of these built to make a canoe into an excellent fishing platform. For that purpose they used a small outboard (2 or 3hp pushes a canoe along quite quickly) attached to a bracket on one of the crossbeams. The outer hulls provide an extra level of safety as they are watertight. The hulls are simple stitch and glue (image right), and the displacement has been chosen for the speed to wash off if the boat heels too much. The crossbeams are simple laminations and look light and simple on the boat. The hulls attach to the crossbeams with butterfly nuts, then the crossbeams are lashed into the hull. For sailing versions the upper mast partner is built into the forward crossbeam and the mast steps on a simple block glued to the bottom of the boat. Unfortunately I don't have any pics of Mr Webb's Fabulous Redbird under full sail - but it was great fun. 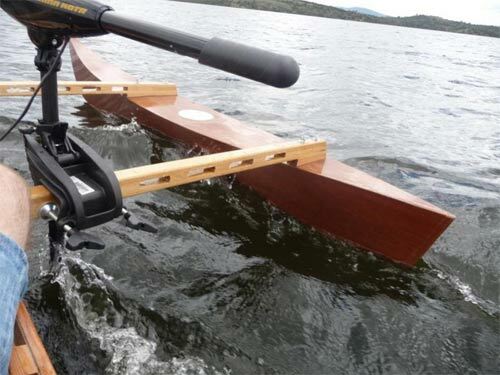 The other advantage is that like the "drop-in kayak rig" when the outriggers are removed from the hull there is only the small block of wood acting as a mast step still attached to the canoe. Because of the potential speed and power of sailing versions we recommend a rudder be fitted to the main hull. Steering it with a paddle would just be too much work! While a simple rudder makes things easy.